Graduates of the 58th Annual Summer Institute Basic Course in Madison, Wis., stand with their certificates in front of the state capitol July 17. 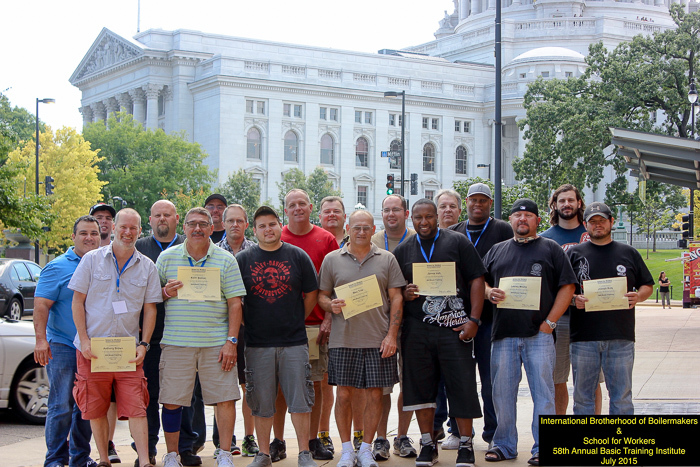 BOILERMAKERS FROM THE United States and Canada attended the 58th Annual School for Workers Summer Institute Basic Course in Madison, Wis., July 12-17. They completed studies in collective bargaining, Brotherhood structure and services, contract costing and research, contract enforcement, labor history, membership mobilization, safety and health, communications and other topics. Participants included Fancisco Fernandez, Local 5, Zone 5 (New York); Gregory Peterson, Local 5, Zone 175 (Oswego, N.Y.); Joseph Rule, Local 11 (Helena, Mont. ); Alex Biddy, James Hall, Sean Harvey, and Max Tritz, Local 19 (Philadelphia); Aaron McRoberts and Justin Warren, Local 84 (Paola, Kan.); Lesley Moore and Bruce Wilson, Local 108 (Birmingham, Ala.); Trevor Loren, Local 146 (Edmonton, Alberta); Keith Boman and Kevin Druin, Local D209 (Speed, Ind. ); Michael Duck, James Orozco, and Eddie Ezell, Local 344 (China Lake, Calif.); Anthony Brown and Glen Miller, Local 580 (Halifax, Nova Scotia); Kevin Hughes and Dan Morrison, Local 900 (Barberton, Ohio); Jonathan Munoz, Local 1600 (St. Charles, Ill.); and Jeff Campbell, International staff. The University of Wisconsin’s School for Workers is the oldest labor education program in the United States.